Prepping the soil in food plots for deer is another important step towards a successful plot. You can not skip any step, and soil prep is easy but it takes place over many months. 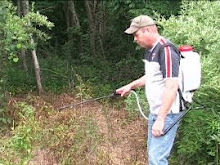 The first step is to kill of any existing vegetation. This is best done with a non selective herbicide like Round Up or the generic glyphosate. Weeds are easily killed when they are rapidly growing. This facilitates maximum uptake and a complete kill. In the spring of the year spray when hardwood leaves are dime sized and make sure it does not rain for at least 24 hours. A complete kill and usually 2 is required before you can establish successful food plots for deer. Patience is truly a virtue when working your food plots. Remember all good things take time, and you can start prepping the soil in food plots for deer tomorrow, but it does not mean they will be ready any sooner. A couple weeks after the first kill, work the soil with a plow, disc or tiller to turn the vegetation under and bring the dirt to the top when performing prepping the soil in food plots for deer. Wait a month and let the seeds hidden in soil germinate and then start the spraying process all over again. After this second kill we will only minimally disturb the soil again in our food plots for deer. We don’t want to bring any more seeds to the top to germinate later. Now we are very close to having our soil prep done in our food plots for deer. Honesty is rough sometimes, but there is no throw and grow miracle that is going to consistently perform in our food plots for deer. It takes time, planning and execution to get the soil prepped to the point we are ready to plant. After we have sprayed, plowed, and sprayed again, we need to rough only the surface of our plot to ready it for the seed. After this we can spread the seed ahead of a good rain, lightly disc or drag the field to cover the seed to the desired depth, and then pack the food plots for deer with a cultipacker or even our 4 wheeler if that is all we have. You can start prepping the soil in food plots for deer any time, but keep in mind a chemical kill will only be successful when weeds are actively growing. If we want our food plots for deer to draw them in, we can not skip any steps. Careful planning according the calendar is crucial, and if you try to skip steps, you are only setting yourself up for failure when planting food plots for deer.